Nun’s Island is part of the Hochelaga archipelago located immediately southwest of Montreal. It’s urbanization followed the opening of the Champlain bridge in 1962 under an ambitious master plan carried out by Metropolitan Structures, a real estate giant who had built numerous projects in Chicago with the collaboration of Mies van der Rohe. 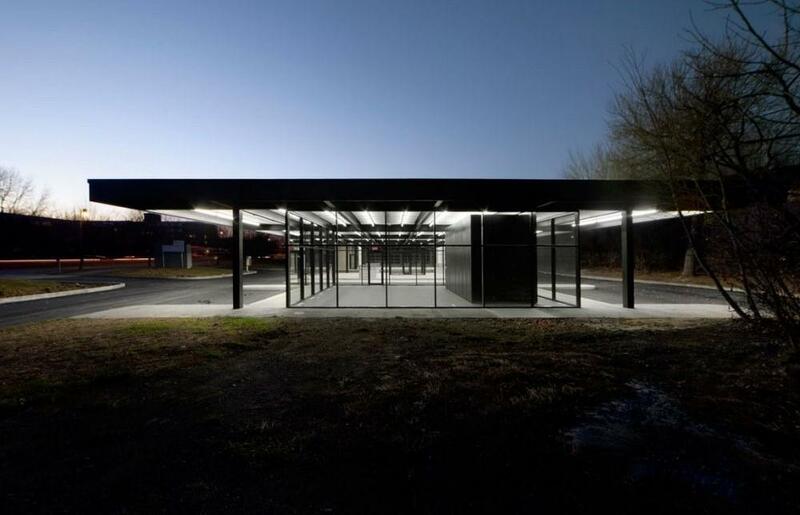 The new community included three high rise apartment buildings by Mies office and it led, in 1966, to a commission from Standard Oil to design a prototypical gas station. 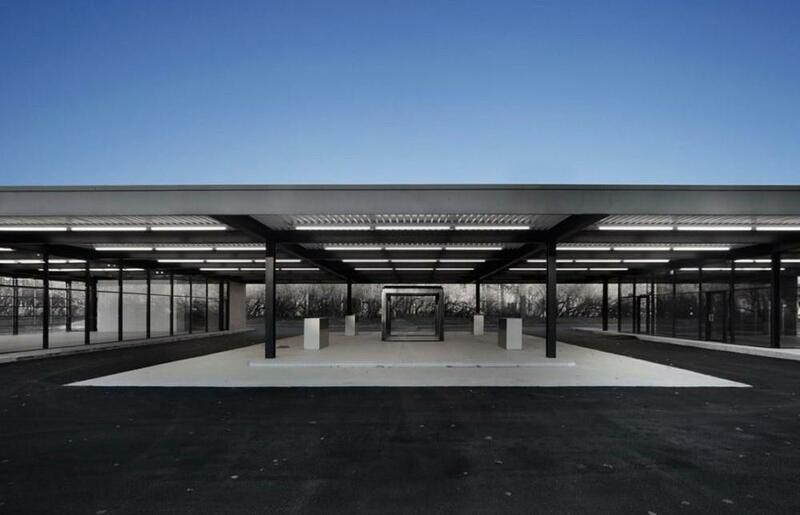 The station consists of two distinct volumes, one for car servicing and the other for sales, with a central pump island covered by a low steel roof that unifies the composition. 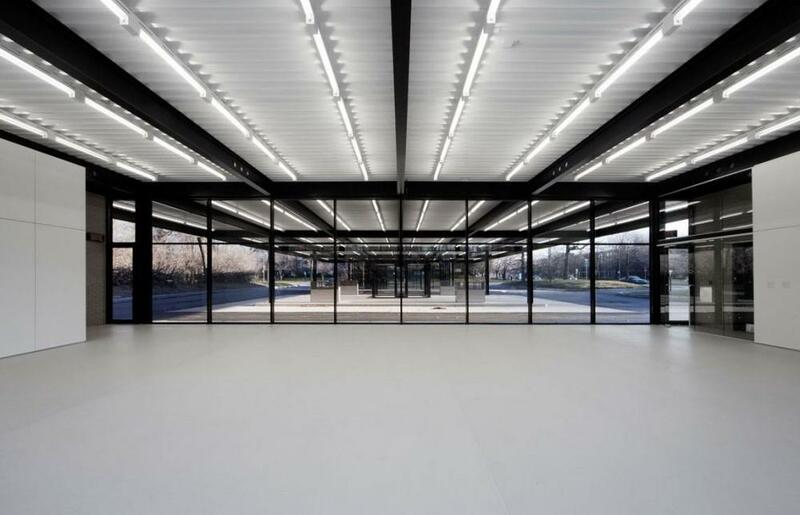 The beams and columns were made of welded steel plates painted black that contrast with the white enamelled steel deck and bare fluorescent tubes. 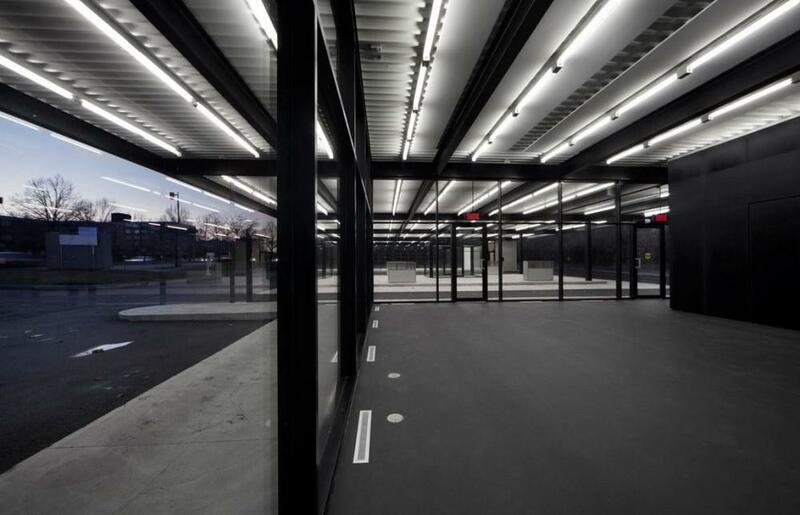 Over the years, the interiors have been modified to incorporate a car wash on the sales side, the finishes, built-in furniture and equipment have been replaced and the custom made pumps removed. 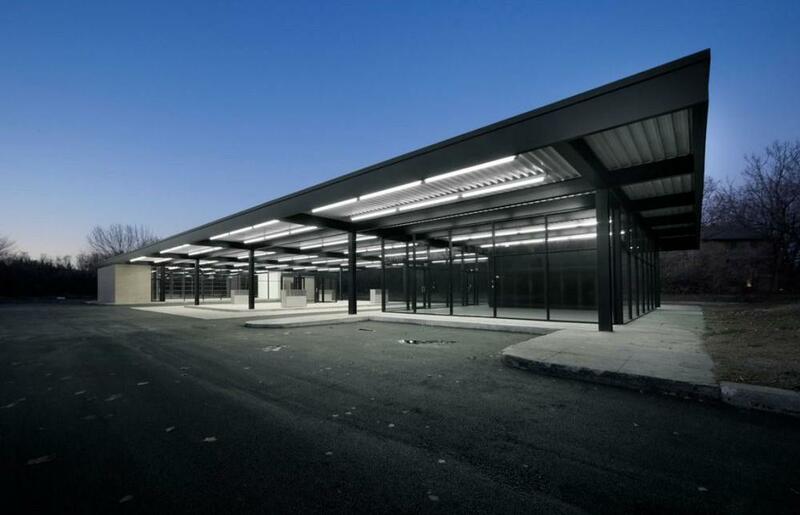 It ceased to be commercially operated in 2008 and the city of Montreal listed it as a heritage building in 2009 before initiating the project of a youth and senior activity centre. This simple program requires an open space for each group to congregate and participate in communal activities. The senior group occupies the larger volume to the benefit of its sixty members who play bridge, prepare communal meals, dance or invite lecturers. Stacking chairs and tables allow multiple configurations of the room. The younger group occupies the smaller volume. Teenagers meet there daily to play games, listen to music, organize parties and events under the supervision of educators. The first architectural task was to meticulously restore the envelope of the building by dismantling and repairing the corroded curtain wall, repointing the brick work and repainting the structure . The second architectural task was to develop strategies for the new mechanical and electrical needs that would not affect the integrity of the heritage values. We choose to implement solutions originating from the sustainable development field of research to achieve this goal. 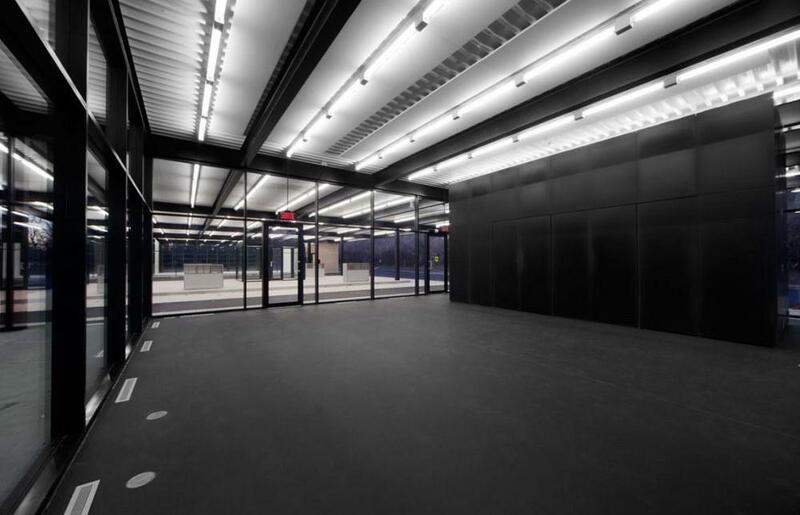 The new geothermal wells under the asphalt around the building provide the major part of the energy required to operate the building but they also radically diminish the size of the equipment and eliminate the need for a cooling tower on the roof of the building. The new stainless steel gas pumps are in fact air in take and out take devices that are linked by underground ducts to the HVAC system. They replace the louvers that we would have had to install on the building and this solution contributes to the pre-cooling or heating of the fresh air admitted , the canadian well effect. The third task was to radicalize the building with the new interventions in order to emphasize its inherent qualities and the essential values that it embodies. Formal unity and simplicity is enhanced by making everything black (teenagers side) or white (elders side). 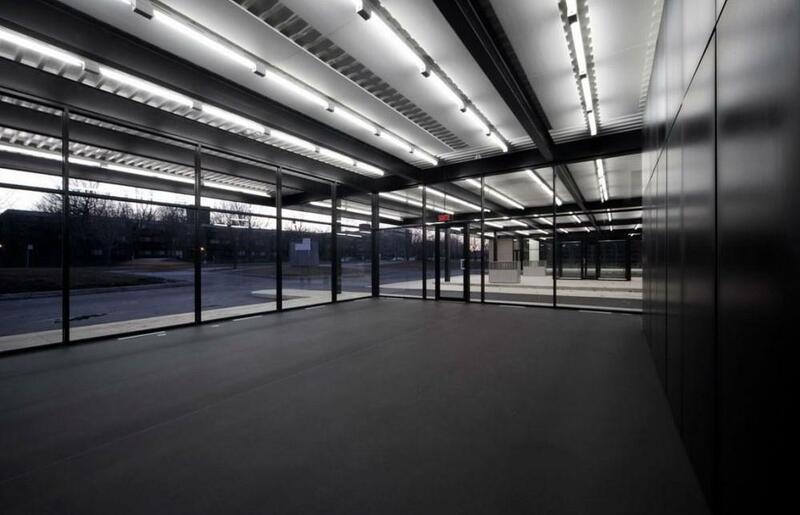 The strength of the roof as a unifying device is reinforced by using the same rhythm of linear fluorescent lighting into the interior spaces (T-5 tubes on dimmers). 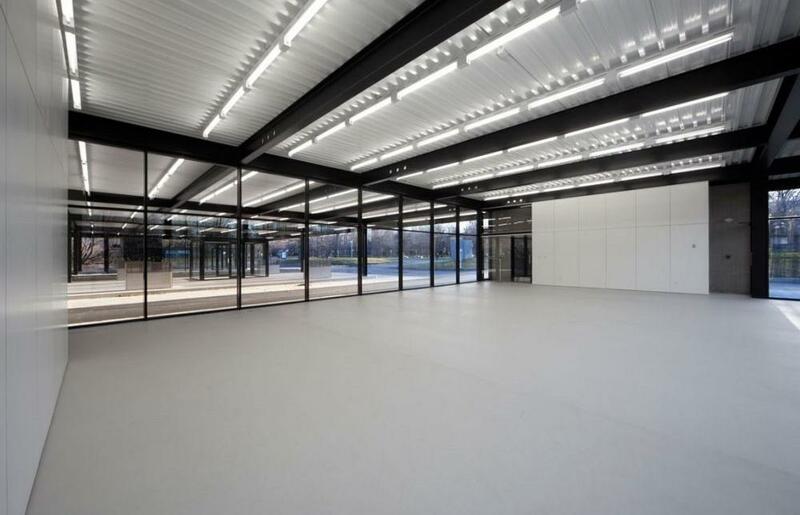 Transparency is augmented by opening completely the view from one end to the other on the long axis and by using low-iron glass. Specific uses and functions have been integrated into freestanding built-in units that are formally mute to dissimulate the contingencies of daily life. The project is not about the faithful restoration of a monument. It is an interpretation trying to touch and communicate the essence of an artistic vision formulated by someone else in response to a world that is no longer the same. Musicians do this every day.